Toilet side rails are a safety feature for the elderly or disabled to make life easier in a bathroom environment. 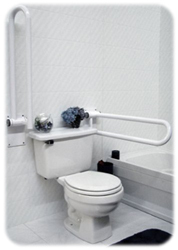 Side rails decrease falls when accessing the toilet, make it easier to get up and down and help get off the toilet. When installed properly, folding toilet side rails are secure, stable and can be conveniently folded up and away. People, who suffer from joint or muscle pain when sitting, can use these rails to alleviate and adjust their bodies in these painful positions. People confined to a wheelchair also find it easier to transfer with these rails around. If you have trouble with toilet transfers, these side rails can act as a stable grab bar, making for more stable standing and transfers from a wheelchair or walkers. I have talked to many people who have these side rails next to their toilet and their experiences are all the same. They can get up easier and are able to spread the physical workload to their upper body. No more grunting, shaky legs, straining at the knees and hips, or worrying about hitting the porcelain. This is especially true for someone who owns the low or standard height toilets. Simply grab the rails, pull with your arms and stand with your legs. Additionally, they do not take up much space when it is not being used. These fixed folding toilet side rails are also referred to as pull down grab bars. They are fixed mounted on the wall on one side or on each side of the toilet. Push them up flat against the wall when not in use and they will remain mostly unnoticed. Here are some recommended toilet side rails. Floor Mounted Fixed Folding Toilet Side Rails – These rails are specially mounted on the floor when you do not want to damage your walls. Right Side Fixed Folding Toilet Side Rails – Also available on the left side. These are wall mounted. Flip Up Grab Bars – These are wall mounted grab bars that can be flipped up once not in use. Fixed toilet grab bars do not fold up and may take up a portion of your bathroom area such as the sides or walls nears the toilet. They work well when someone needs stability when approaching and getting up and down on the toilet. Toilet grab bars are often used after an illness, injury or surgery to increase safety and avoid any falls. These fixed toilet side grab bars when compared to fixed folding toilet side rails are relatively inexpensive. Depending on what type you prefer they usually range from $15 to $40. Here is a list of recommended fixed toilet grab bars. Angled Grab Bars – Angled to provide diagonally and horizontal support next to the toilet. 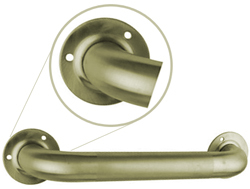 Chrome Toilet Grab Bars – Supports up to 300lbs. Toilet safety rails can extend from behind the toilet and to the floor, mounted on top of the toilet or on the toilet seat. They offer the same amount of stability as fixed folding toilet rails but they do take up the area on and around the toilet. If you can agree to lose some space, these toilet safety rails are a much more affordable alternative. Here are some safety rails with great reviews. 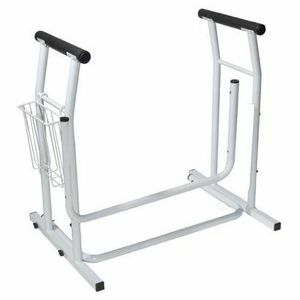 Adjustable Height Toilet Safety Rails – Supports up to 250lbs. Very easy installation. Extra Wide Elevated Toilet Seat with Arms and Legs – Has strong steel legs that support bariatric users up to 600lbs. Raises toilet seat height an extra 4 inches. Soft foam padded side rails. Regardless of whether a person prefers folding toilet side rails, fixed toilet grab bars or toilet safety rails, be sure to make it a priority in your bathroom. They all can prevent injury and assist in bathroom maneuvering. Installation is quick and easy for most professional DIY’ers but should be tested to make sure they are completely secure. Be sure to give it a nice tug as a test when they are screwed into a wall stud. Toilet side rails are available online at the handicapped equipment store and at most durable medical equipment supply stores. Making sure a loved one has as much safety at their fingertips as possible gives everyone a sense of well-being. A bathroom fall has a high incident of serious injury because of the hard floors and exposure to wet areas. Grab bars and side rails increase safety and peace of mind. For many men and women getting off the toilet can be hard and aggravating. Those who have the problem with getting up are ones that have hip, knee, back or leg problems that prevent them from moving around as they once did. This makes it difficult to get up and down with ease. When this happens it is up to the family members to come in and assist with getting them up. A lot of times there is no one around when an elderly loved one becomes stuck on a toilet and can’t get off. This can leave them feeling helpless alone and scared. This is where toilet assist equipment can relieve those fears and potentially save a life. 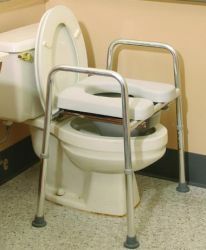 If you are wondering where you can find aids to help the elderly off the toilet, then check out some of the supplies and equipment one can purchase to prevent someone from having a hard time getting off the toilet. Local department stores, medical supply stores and online medical equipment stores have just about anything you can think of to improve someone’s way of living when they have medical needs such as this. Here is just a few of these toilet equipments. Toilet safety rails are an excellent idea to have in place for someone who has difficulty getting up and down while in the bathroom. Older people and post surgical patients may need more help getting off the toilet if they lost a lot of their strength and balance. You can attach these rails to the wall on either side of the toilet or attach near the shower doors to assist with getting up. Make sure that the toilet rails you purchase can hold the persons weight and that it’s attached securely so it won’t pull off when the person is getting up off the toilet. These rails range in price from $15 to $30 dollars depending on length style and store pricing. In addition, there is a whole assortment of handicap bars that is useful near the toilet and also work all around the home. Using toilet side rails is another wonderful option for those with difficulty getting up and down. Side rails can be placed on either side of the toilet and is easily accessed because it can be placed closer to the person. These are usually longer and thicker in diameter then other rails. It’s like a hand rail in a way and in some opinions is a better option. They tend to last longer and don’t pull off as quickly as other rails might. Toilet side rails are attached to a wall only. These rails range in prices from $20 to $40 dollars and again depend on length and store pricing. Here are some recommended handicap equipment to help those who have difficulty getting off the toilet. It is especially important to know the size of the rails and of the toilet. These are the best prices found online and even in stores. Screw On Toilet Side Rails – This is an ADA complaint toilet side rails with stable 8 inch high armrests. It is also rustproof and easy to clean. Fits most standard toilets. 250lbs and is larger than the previous one. It is also slightly more expensive. However it is a lot easier to install and has two footrests that provide more stability. 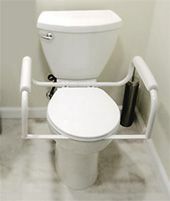 Strong Toilet Frame With Rails – Place this toilet rail on top of a standard toilet for a sturdy support rail. There are also elevated toilet seats that reduce the distance from sitting down and standing up. They are great to reduce strain on the knees and for those who recently had surgery on their hips or knees. Add these seats with hand rails for getting off the toilet and you have the perfect combination of safety. The equipment and supplies you purchase to assist a loved one getting on and off the toilet is essential to their well being. It helps them to become independent when you are not around to assist them when needed. No one likes the feeling of helplessness when they are on the toilet.